I just love it when new photographs surface. 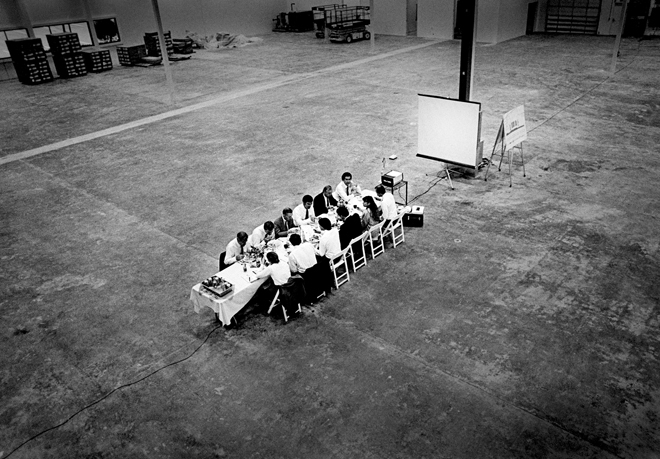 Taken in the early days of Silicon Valley many of these feature Steve Jobs and other luminaries at the beginning of something great. There's even a photograph of the possible moment that kicked off David Hockney's enthusiasm to make art with a computer. He's now known for using he iPad to paint works which have been most recently on show at the Royal Academy of art but at the time this photograph was taken he'd only previously arranged photographs by hand, creating some of his most famous works such as Still Life Blue Guitar (1982). 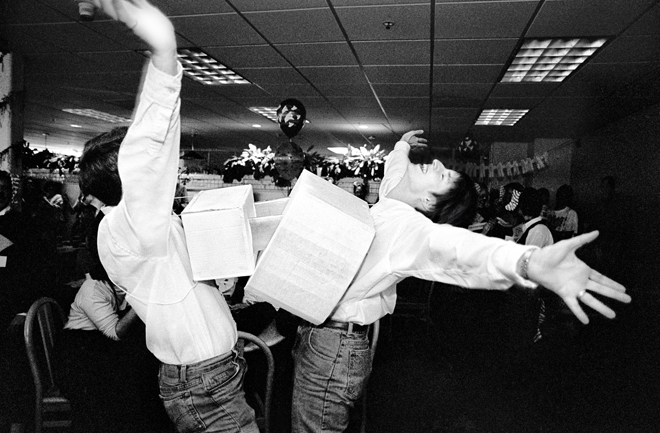 The photographs were taken by Doug Menuez, a photojournalist who documented the rise of the golden era of Silicon Valley over a period of 15 years. "As digital technology grew more powerful, Silicon Valley resembled what Paris in the twenties must have been like. Artists arrived from all over the world, eager to experiment," Menuez told Wired. 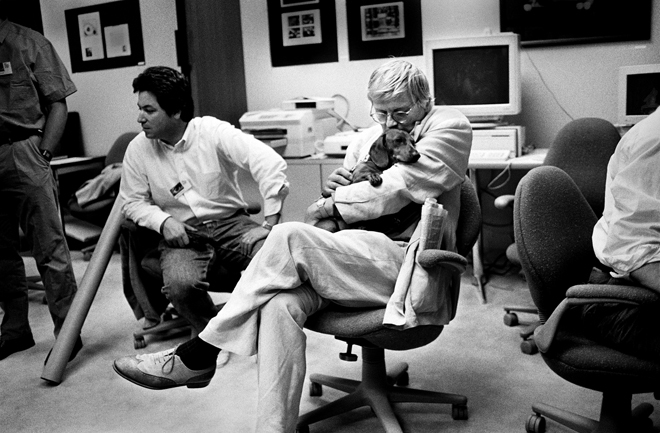 "David Hockney, holding one of his beloved dachshunds, attends a 1990 Adobe Photoshop Invitational, where he learned how to use the first release version of Photoshop." It's part of a set of black and white images which has just seen the light of day after it was curtailed by Steve Jobs who features in many of the images. The photographs portray Jobs in the years after he was ousted from Apple and the beginnings of NeXT (the computer that Tim Berners-Lee would eventually create the internet on) including the meeting in the soon to be NeXT factory where Jobs received the investment he needed to start his new company. 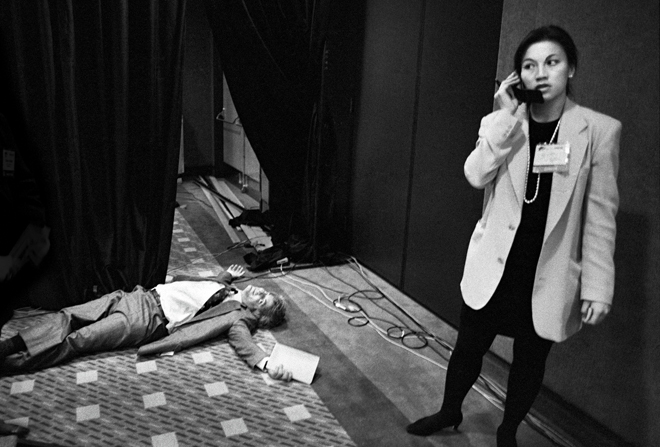 Preparations for the demonstration are not going well in Las Vegas (1992) above, is one of my favourites from the selection on Wired.com. Here's what Menuez had to say about it: "Unfortunately, while preparing a demonstration of the Newton for the national press in Las Vegas, the device crashed, causing event organizer Michael Witlin to hit the floor and Tricia Chan to call engineers for help."